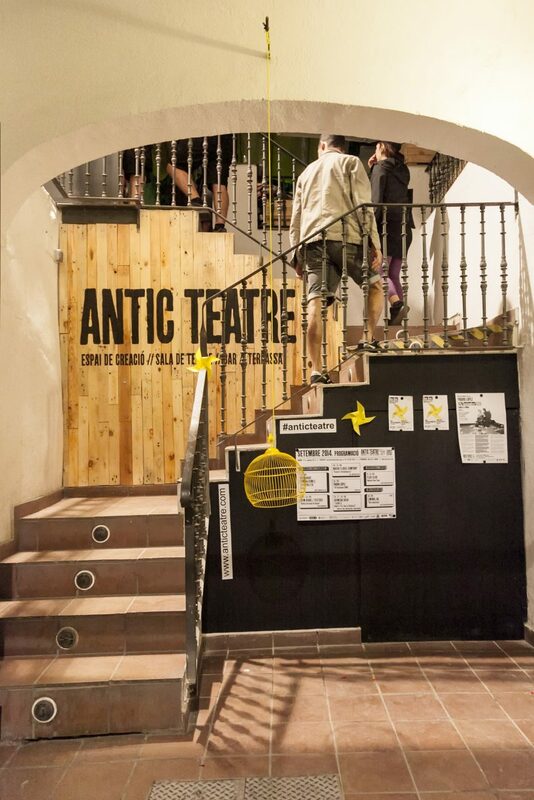 Antic Teatre – Espai de Creació, better known as Antic Teatre, is an independent Social and Cultural Centre occupying a building that dates back to 1650 and has been listed in the City of Barcelona’s Architectural and Historical Heritage Catalogue since 1979. In between the Santa Caterina market and the Palau de la Música, in the very heart of the city, it has become a landmark venue for the neighbourhood with its unique garden and wealth of cultural and social history. Antic Teatre is one of the flagships for today’s independent live performance arts scene. Its MISSION consists in supporting and encouraging RISK and INNOVATION in the search for and development of new languages for multidisciplinary performance that avoid rote-learned techniques and much repeated methodologies. – Existing as a centre for experimentation, creation, residencies, production, exhibition, promotion and distribution by and for PROFESSIONAL ARTISTS whether local, national or international. – Giving particular support to YOUNG AND EMERGING CREATORS presenting their FIRST PROJECT or show, but without forgetting experienced independent artists beginning to make their name and artists with long and recognised careers. – Defending our position as an INDEPENDENT AND SUSTAINABLE cultural and social centre in which connection to the community and the local environment play a fundamental and guiding role. – Going beyond the production and exhibition of shows by encouraging artists in the creation of ARTISTIC PROJECTS WITH THE LOCAL COMMUNITY, and collaborating with all artists and collectives that are socially and politically active in defending the interests of the sector as a whole, and who are committed to their social environment, in creating a place that facilitates ecounters and debate between neighbours, citizens, audience and artists. See Antic Teatre’s POLITICS here. – Antic Teatre received the award for most innovative programming in spain from the HUESCA INTERNATIONAL THEATRE AND DANCE FAIR 2004.